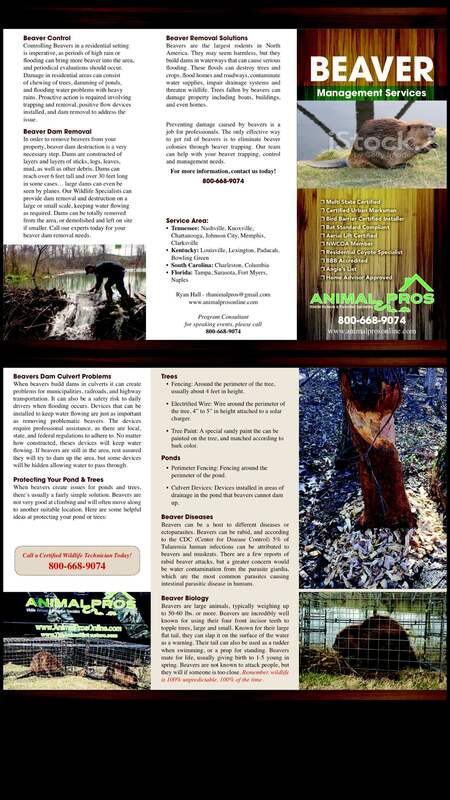 Animal Pros in Nashville is your best solution for beaver removal, trapping, and dam destruction in Middle Tennessee. Beavers are the largest rodents in North America. They may seem harmless, but they build dams in waterways that can cause serious flooding. These floods can destroy trees and crops, flood homes and roadways, contaminate water supplies, impair drainage systems and threaten wildlife. Trees fallen by beavers can damage property including boats, buildings, and even homes. Preventing damage caused by beavers is a job for professionals. 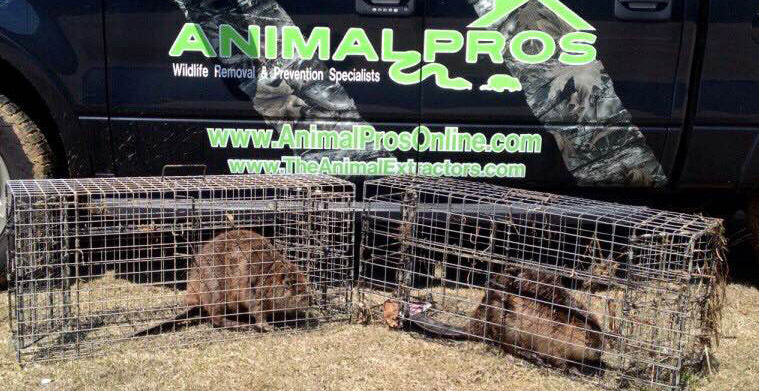 Our team can help with your beaver control needs. Contact us if you would like to know more about what can be done to protect your land from the problems beavers can create and our humane beaver relocation practices. The only effective way to get rid of beavers is to eliminate beaver colonies through beaver trapping. If you are having problems with a beaver on your property, give us a call. Beaver can cause damage to your property and possibly cause flooding. They are a nuisance animal that should not be allowed to run free near your home. 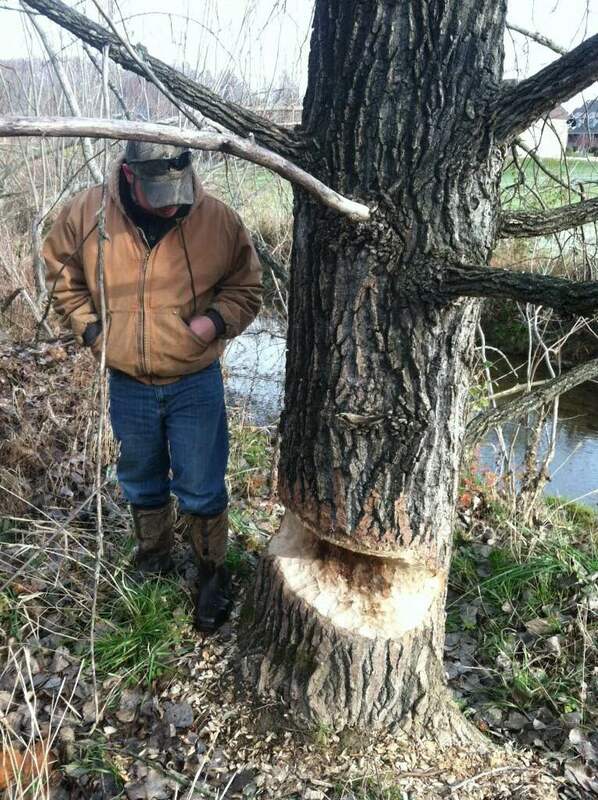 Let our professionals help with your beaver removal needs. 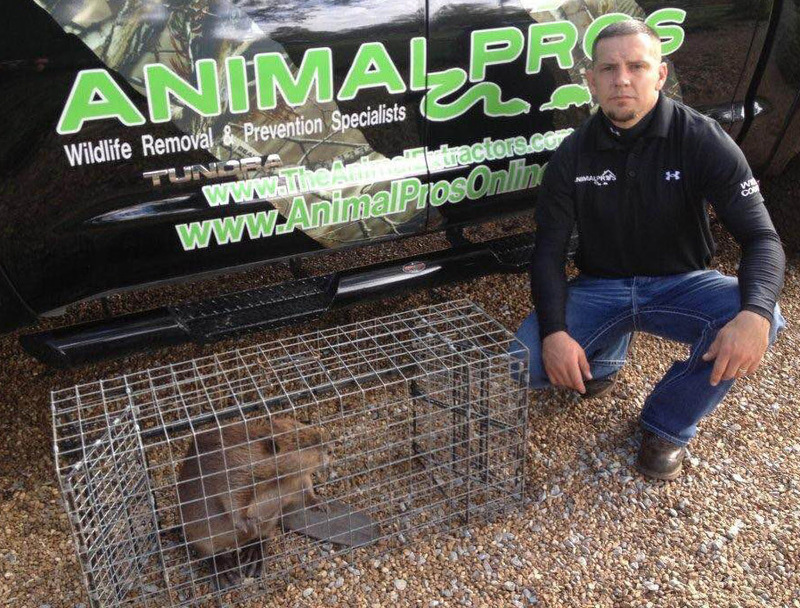 Animal Pros will help you with beaver trapping in Nashville. Beaver Dam destruction is a very necessary step in addition to removing Beaver. Dams are constructed of layers and layers of sticks, logs, leaves, mud, as well as other debris. Dams can reach over 6 feet tall and over 30 ft long in some cases, and large dams can even be seen by planes. Our Wildlife Specialists can provide dam removal and destruction on a large or small scale, keeping water flowing as required. Dams can be totally removed from the area, or demolished and left on site if smaller. Call our Experts today for your Beaver Dam Removal needs. Controlling Beavers in a residential setting is imperative, as periods of high rain or flooding can bring more beaver into the area, and periodical evaluations should occur. Damage in residential areas can consist of chewing of trees, damming of ponds, and flooding water problems when heavy rains. Proactive action is required involving trapping and removal, positive flow devices installed, and dam removal to address the issue. It is a very sad sight to see several homes in a neighborhood flooded, because nothing was done about the beaver problems. Beavers creating problems in culverts can create problems for municipalities, railroads, highway transportation, and even be a safety risk to daily drivers in times of flooding. Devices that can be installed to keep water flowing is just as important as removing problem beavers. The devices are not the easiest to install therefore professional assistance is required following local, state, and federal regulations. No matter how constructed, theses devices will keep water flowing. If beavers are still in the area, rest assured they will try to dam up the area, but some devices will be hidden allowing water to pass through. Beaver problems concerning ponds and trees can be easily fixed by some simple methods. Beavers are not very good at climbing, and will often move along to another suitable location. Here are some helpful ideas at protecting your pond or trees. Fencing – Around the perimeter of the tree, usually about 4′ in height. Electrified Wire – Wire around the perimeter of the tree, 4″ to 5″ in height attached to a solar charger. Tree Paint – A special sandy paint the can be painted on the tree, and matched according to bark color. Perimeter Fencing – Fencing around the perimeter of the pond. Culvert Devices – Devices installed in areas of drainage in the pond that beavers cannot dam up. Beavers can be a host to different diseases or ectoparasites. Beavers can be rabid, and according to the CDC (Center for Disease Control) 5% of Tularemia human infections can be attributed to Beavers and Muskrats. There are a few reports of rabid beaver attacks, but a greater concern would be water contamination from the parasite giardia, which is the most common intestinal parasitic disease affecting humans. Beavers are the largest rodent in North America typically weighing up to 50 – 60 lbs or more. Beavers are incredibly well known for using their four front incisor teeth to topple trees, large and small. Known for their large flat tail, they can slap it on the surface of the water, as a warning. Their tail can also be used as a rudder when swimming, or a prop for standing. Beavers mate for life, usually giving birth to 1-5 young in spring. Beavers are not known to attack people, but they will if too close. Remember, wildlife is 100% unpredictable, 100% of the time. Diet: Herbivors, eating plants, woods, and bark. Breeding: Starts in January and February. Reproduction: 4 young born once annually starting in late May. Habitat: Urban and rural rivers, streams, wetlands, ponds, lakes, and creeks. Legal Status: Common throughout Tennessee, and open season year round with no limit according to the Tennessee Wildlife Resources Agency. Other Names: Often mistaken for Muskrats, Otters, Groundhogs, and Nutria. Water Rat, Water Woodchuck, and Wetland Groundhog. Interesting Facts: Beaver dam destroyed, can be built back up overnight by a Beaver. The major water source contamination by Beavers is from the parasite “Giardia lamblia” also known as “Beaver Fever”. Beaver removal is the best solution for someone experiencing beaver problems. Without removing beavers, damage will continue. Heavy rains can trigger a increase in beaver activity. If you notice activity, professional assistance should be used. There are several methods for removing beavers and trapping, but only a few methods that are safe in residential and commercial settings. Traps are placed in high activity areas focusing on beaver slides, beaver runs, trails, beaver dams, and even submerged in cases. Professional assistance is recommended for professional results.